JUst GORgeous! What FABulous colours this easel card is..LOve your image too. Thank you soooo much for joining us this week at C.S.A.Y.L. Hopefully we will get better weather soon in the UK. Beautiful card Sylvie, love the gorgeous image and design. Hi Sylvie this is WOWWWW that image, the colours and design look stupendous, awesome card. Oh Sylvie I love this and I adore your backdrop hunni!! Soooo jealous. Beautiful card. I'm not a big fan of kraft, but I love the combination you have created white the white and red (and kraft, obviously). Such an elegant look. Thanks for playing with CSAYL. 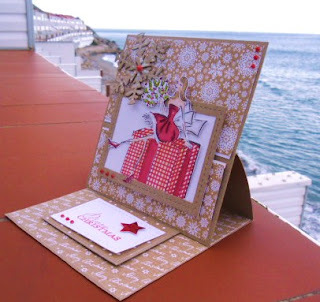 Gorgeous card...love the white snowflakes on the kraft paper and I think an easel card always looks so special! The kraft, white and red is a great colour combo too!!! Its beautiful inside and out, love the colors and great stamp. Snow is gone but still zero, brr cold... thanks for sharing and have a great day..
Fab! Love the Kraft with the snowflakes and the bit of red just finishes it off perfectly. Don't know why but your posts aren't updating in my reader. Eine sehr schöne Karte. Gefällt mir sehr. Beautifully done...love the red with the Kraft/white, it's so striking! Oh Sylvie, that is so beautiful! Gorgeous - I wished I looked like that on Christmas day! I hope the cold doesn't materialise! Hi Sylvie, love your easel card and the colours. Oh to have long legs like that!!!! Beautiful card Sylvie, I like the image, the colours and the big snowflake. Absolutely lovely, Sylvie. Brilliant use of kraft. I just noticed that you're not appearing on my blog list... so strange. I keep missing your beautiful work. Sassy! I have to admit my eyes were drawn to the setting! Thanks for joining us at CSAYL!!! Hola Sylvie, thank you for your comment, fantastic cards Sylvie, the little boy skating have a great colouring job, all yours cards are just gorgeous. Beautifully created easel card, Sylvie. I love your image and fab colour combo.